You know Michael is rocking the house when you see his license plate, MIDRUM, in the parking lot. Having worked the New York scene for years, he lives in Sonoma and does sessions all over the Bay Area. 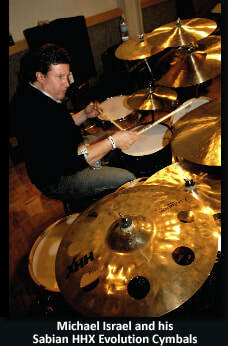 An avid drum collector, he has some of the finest kits and snare drums. He cracks a snare drum like no one and his knowledge of tuning makes the drums marvelously easy to record. Michael's style is a mix of fusion stylings, deep groove, with a good rock sensibility. He’s recorded with Joe Bonamassa, Tony MacAlpine, Greg Howe, Roger Glover (Deep Purple), Noel Redding, Richard Tee, Will Lee, Roger Ball (Average White Band), Norah Jones, Vaneese Thomas, Iggy Pop, Tony Levin, and Ivan Julian as well as touring with A Flock of Seagulls, and Viv and Willi Jones. Sound tracks include Frankenhooker and Basquiat. Michael endorses Sabian Cymbals and Vic Firth drumsticks. He also is crazy for cymbals. Working with Dave Weckl, initially as his drum tech, Michael provided help and input of the creation of both Evolution and Legacy cymbals for Sabian. He's got a great attitude, a big heart, and a sense of humor. Rate: $175 per song, plus studio time. Discounts for many songs in one session.